On February 18, 2015, an explosion in the Electrostatic Precipitator (ESP) unit at the Torrance ExxonMobil Refinery shook the community and registered 1.7 on the Richter scale. The explosion blasted off a chunk of the ESP the size of a fully loaded semi-truck & trailer (80,000 lb.). Falling from 12 stories up, it accelerated to 60 mph before crashing three feet from the acid settler tank containing 50,000 lb. of volatile and toxic modified hydrofluoric acid (MHF). At a January 2016 hearing, the federal Chemical Safety Board (CSB) investigated and declared this a “near miss” on a catastrophic MHF release. This information had not been made public by the refinery or the City of Torrance in its report on the explosion; it first came to light from a CBS Evening News expose in September 2015. According to the United Steel Workers International, “No industrial process risks more lives from a single accident than does… alkylation using HF,” because HF (and MHF) form a ground-hugging dense vapor HF cloud upon release. ExxonMobil has denied CSB’s requests for information on the alkylation unit, where MHF is used. This is what they have to hide: MHF was put in place by the 1990 Torrance-Mobil Consent Decree to “significantly reduce” the danger from hydrofluoric acid (HF). But MHF is actually 90% HF and almost exactly as deadly. The safety claims made for MHF are bogus, and the public has been fooled. According to Vanessa Sutherland, the chairperson of the CSB, hydrofluoric acid (HF) is “one of the most hazardous and deadly chemicals.” With even minimal exposure, HF causes painful, slow-healing chemical burns and damages internal organs and bones. “In worst-case scenarios, at deadly levels, it causes asphyxiation because once inhaled it causes respiratory problems that build up fluid and you ultimately drown,” Sutherland said in an interview with CBS News. Fluoride ions from HF can penetrate intact skin, enter the bloodstream, and bond with calcium, making it unavailable to the body. This can cause death or permanent organ damage. Symptoms can be delayed. For this reason, immediate medical attention is required for even modest exposure. When released, hydrofluoric acid forms a dense, rolling cloud of toxic gas. Since the HF cloud is heavier than air, it stays close to the ground, traveling with the wind for miles. 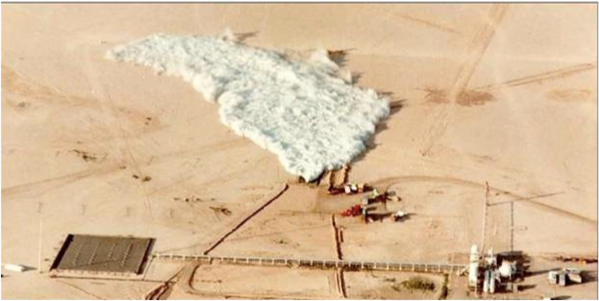 This can be seen in a video from the “Goldfish” hydrofluoric acid release tests, conducted by the Amoco and Allied Signal corporations in the Nevada desert in 1986. In the test, researchers released 1,000 gallons (8,300 lb) of HF and were surprised to discover that 100% of the acid became airborne in a dense vapor cloud. Sensors detected an HF concentration four times the potentially lethal limit 2 miles from the release point. One year after the Goldfish test, 165 lb of HF was released at the ExxonMobil Torrance Refinery (now PBF Energy’s Torrance Refining Co). 10 employees suffered chemical burns requiring hospitalization and windows were blown out of nearby homes. A chemical fire burned for 17 hours. The incident caused $17 million in damage. Following the 1987 release, the City of Torrance filed a public nuisance lawsuit against (then) Mobil’s Torrance refinery to stop the use of HF in the community. This was settled by the 1990 Consent Decree, under which Mobil promised to develop a modified form of HF that was SAFE, because it would form no dense vapor cloud upon release. To accomplish this, the MHF compound would be 50% HF and 50% additive. If MHF failed to be safe, Mobil promised to replace HF with sulfuric acid, a liquid that poses virtually no airborne risk. In 1994, Mobil admitted MHF would not be safe; 50% additive would make MHF unusable in the alkylation unit. Instead, the MHF compound would be 70% HF and 30% additive. As a consequence, 35% of accidentally released MHF would still become airborne in a ground-hugging HF cloud. At that point, the city could and should have forced Mobil to abandon MHF and switch to sulfuric acid. But instead, it accepted the advice of Mobil, the “independent” Consent Decree Safety Advisor Steve Maher (an oil industry insider), and Torrance Fire Chief R. Scott Adams to change the Consent Decree and permit Mobil to use “less deadly” MHF. But even this reduction in HF deadliness was not to be. At the end of 1997, the new MHF unit failed immediately upon start of operations. Safety Advisor Steve Maher stated in his undisclosed 1999 report the alkylation unit was “dangerously unstable” and produced only a little product of poor quality. Mobil shut the unit down immediately. By May 1998 Mobil had slashed the additive by a factor of 3, to a symbolic 10%. Mobil added another bogus proprietary “safety” technology to cover its back in case MHF’s failure were to be exposed. Torrance Fire Chief R. Scott Adams wrote the city report approving the changes. Then he retired and got a job as a consultant for Steve Maher’s firm. No consent decree documents have been found that show the city or court were informed of the changes and approved them, despite claims by ExxonMobil and city officials. The public was never informed of MHF’s failure. In conclusion, from the beginning of successful operations and without the public’s knowledge, real life MHF has been 90% HF. No higher additive concentration can be used. MHF is a fraud. Upon accidental release, ~90% of MHF becomes airborne upon release, compared to 100% for HF. The toxic distance for a MHF release is a mere 7.9% shorter than for a comparable HF release (e.g., 9.2 mi instead of 10 mi). MHF hazards are therefore equivalent to HF hazards. Despite that, the City of Torrance report on the 2015 explosion falsely summarized MHF hazards thus: “remains on ground.” The public has been deceived since 1990 and still is being deceived. It’s long past time for a ban on MHF/HF.